Ben and Holly have fun and games helping Gaston the Ladybird clean up his messy cave, they go on a trip into The Big World with tooth-fairy Nanny Plum, even plan a surprise birthday party for King Elf, and oops, let's hope there's not another jelly flood! 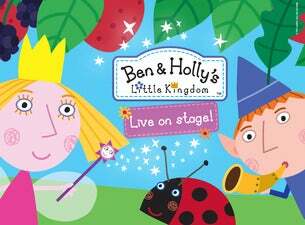 Join Ben and Holly, and their friends on this exciting musical adventure packed full of games, songs and laughter on an enchanting journey through the Magical Kingdom. With actors, masks and colourful costumes this beautiful story of elves, princesses and childhood innocence will delight all the family.